If you have developed an interest in baking, it probably won't be long before you come across an American recipe that you want to try. I have a number of favourites, but remember when I first tackled one. There were a number of differences that I had to get used to. I thought it might help to post about them, particularly as I'll no doubt be blogging about recipes that I have tried! 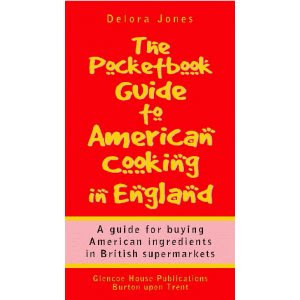 The first thing I want to mention is a fantastically useful little book, 'The Pocketbook Guide to American Cooking in England' by Dolores Jones, which cost me £3.99. I got my copy of it from Amazon some time ago, and the website is currently showing it as temporarily unavailable. I don't know if it's out of print, but if you can get your hands on one I'd recomend it. I know that you can probably find most of the information on the web, but I've found it realy handy to have a paper copy of the conversion charts, and other things it contains, alongside my cookbook when I'm trying to 'translate' American recipes into something familiar. There are, of course, differences in ingredients that go beyond simply how we pronounce words. I've set out some of the most important I've found when it comes to baking. All purpose - this is equivalent to Plain flour. Cake flour - this is a particular kind of flour that is a softer grain and has been chlorinated. It's available from some of the Amercian produce websites on the net (such as http://www.americansweets.co.uk/) if you can't find it anywhere else. This varies according to the fat content. Half and Half: I often see this in Barefoot Contessa recipes. It's basically easy to recreate using a mix of half single cream and half milk to get the amount you need, so if you need 200ml of half and half, use 100ml cream and 100ml milk. Light cream: this is approximately equivalent to singlecream, although the fat content can be higher. Light whipping cream: equivalent to creme faiche (not the low fat version!). Heavy cream: this is broadly equivalent to our whipping cream, but I have used double cream with no disasters! Sizes are slightly different to UK sizes, and based on weight. I've roughly translated US sizes Medium and Large, to UK Medium, and US Extra Large to UK Large. Confectioners: equivalent to icing sugar. Dark, or semi-sweet: equivalent to plain. I had never appreciated that you could get different cocoa powders until recently reading Martha Stewart's 'Cupcakes'. If you're interested, David Lebovitz at http://www.davidlebovitz.com/2010/02/cocoa-powder-faq-dutch-process-v/ provides a clear and helpful explanation which I found really useful. Since then, as far as I can establish, Green & Black's is definitely Dutch processed, and I understand that Valrhona and Cadbury's Bourneville are. If you are specifically looking for 'natural' cocoa, the internet is a good place to look - Hershey's do one which is stocked by one of my favourite places in Cardiff, the institution that is Wally's Deli in Royal Arcade ( http://www.wallysdeli.co.uk/ ). This is vegetable shortening. US bakers will have their favourites and a well known one is Crisco. You can use Trex which is widely available here. 1 stick (1/2 an American cup) is equivalent to 40z (113g), and a tablespoon would therefore be equivalent to half an ounce (14g). The first time I made an American recipe, I didn't think anything more of this and when I encountered 1 cup of this and 1 cup of that, just used a set of measuring cups from Tesco. While experience has taught me that there are smallish differences in the volumes, partiuclarly for small amounts, I'm not sure how radically it makes a difference. Yes I know that baking is often referred to as akin to chemistry, because of the reactions that go on and so you have to get the proportions correct, but when I have used UK cups, it's not really caused me a problem. That said, a family holiday to Florida gave me the chance to become a proud owner of a set of All-clad measuring cups and spoons and now a purist when it comes to measurements (not that I'm obsessed). They're relativey cheap to buy when you're there and small to fit in a suitcase, but if you are desperate for them, many US retailers, such as Williams-Sonoma, now ship certain items to the UK. My All-clad American measuring cups - they look like miniature saucepans! So the difference becomes more marked when the volumes become higher. When measuring ingredients by cups you also need to know how different ingredients are measured. Flour for example, is normally 'aired' (i.e. stirred) and then the cup dipped in and filled, with a knife used to level off the cup. Sugar (like soft brown) is usually 'packed' into the cup - pushed down to get more in. Just be careful, I guess, to use the right way. I obviously haven't included everything here that is relevant to baking from American cookbooks, but I hope you find this helpful, as there are some fantastic Amercian recipes and books out there and you don't need to be put off them by the differences! If there are any others that you have come across during your baking, I'd love to hear of them.